Skills and Abilities: How do they Affect my Choices? This post is part three in a series written by Coach Matt titled Who Am I.
Merriam-Webster’s dictionary defines skills as a developed ability, whereas abilities can be defined as a natural or acquired skill. So what are my abilities and/or skills? What am I capable of doing that can aid in the accomplishment of something? The choices I select on a daily basis are not only determined by my knowledge but also by the skills and abilities I possess. If my skill/ability set, in relationship to the task, is very high, then my choices will have greater variety. Once again with great variety in choices, one must make the most appropriate decisions as directed by specific goals. If you then combine an enhanced knowledge base with a large skill /ability set, effective youth sports teachers (coined in The Importance of the Effective Youth Sports Teacher by Coach Brad) are forming. Why just forming and not developed? To truly begin to reach the effective youth sports teacher distinction, interests and personality also play a role in the choices I make which define who I am as it relates to self-awareness and me as a leader. Continuing with my example as a collegiate baseball player, I would like to look at the role my skills and abilities had on my choices. After my first year as a red-shirt pitcher, I remember sitting in my coach’s office for our post season wrap-up meeting and hearing the words, you may not make this team next year. So, I took this as my skills were not good enough to play at this level and that if I want to play, I have to get better. My choices coming out of this meeting were to either work harder or quit. Quitting was never an option so my only choice then was to work harder. What would my choices have been if my skill set as a player were better? Do I get to play summer ball in a collegiate league where the coaching staff of collegiate assistants can help me further my career? After spending 3 years improving my game, I finally achieved my first goal set as a freshman – to become a starter in the rotation. With this role, my leadership opportunities grew. The only leadership skills/abilities I had developed were related to effort. With this low level of skills/abilities related to leadership my only choice was to continue with what I knew was successful – work hard and hope people follow. What choices would I have had if we had leadership training during the previous 3 years of my athletic play? If I have had greater choices how many more people could I have affected? Why do most coaches only focus on the game related (technical) skills? 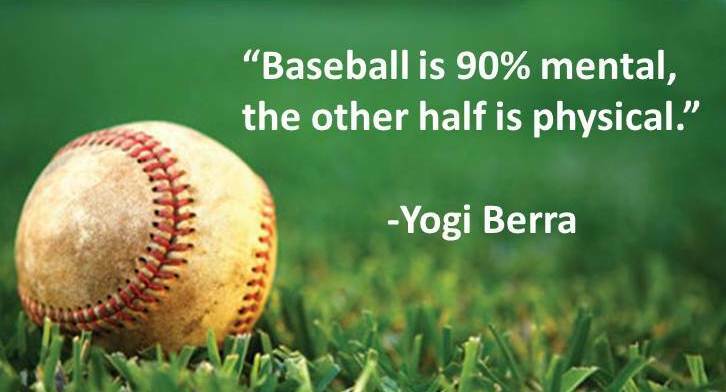 Yogi Berra stated it best when he said the game of baseball is 90% mental and the other half is physical. How often are you as a coach working on the mental skills related to the game? What is your knowledge base and skills/abilities related to the mental approach to the game? Remember your choices will be affected by both of these. To create a more rounded athlete, read, learn, and develop a higher skill/ability set. My next post will touch on the last 2 components of self-awareness which are your interests and your personality. Thanks for following the blog and the great comments. You bring up some great questions that hopefully I can answer here in the reply. A lot of the concept you mention will be in future blogs over the next few weeks once my current series is complete. As you stated most coaches will typically only do what they know which will limit the potential growth in their athletes. Change and willingness to change are a necessity in order for growth to occur. The topic of change will be a future post so make sure you continue to follow EducatedCoaches.com. As we look at how we as coaches can integrate leadership training into our program, we must first be open to CREATE quality training sessions. As stated by Coach Brad in an earlier post, creating quality training sessions takes time as well as knowledge. Adding leadership training to your training session is as easy as designing your quality technical/tactical session. You must design a program that is developmentally progressive that relates over sessions, weeks, and months while being prepared to adjust on the fly. Leadership training begins with determining the qualities of a great leader and teaching them to your athletes. The 3 key elements of implementing the material (delivery, review, and evaluation) will factor into the success of the sessions as they relates to leadership training. So how and when do you do it? Leadership training can be done in large groups, small groups, as individuals, prior to, during, and after the training session. The session focus should be simple because providing too much and too complex information will overwhelm your athletes. For example let’s say communication (leadership quality) is a focus. In your 1st session you may introduce the concept in the first few minutes prior to the warm-up. I will call this the session introduction. As the session moves on you can evaluate the communication that is occurring within your athletes (note specifics on a paper during breaks). At the completion of the session, for a few minutes, ask your athletes their thoughts on how they communicated during the session (have questions ready that can spark conversation). During the next session you may focus specifically on non-verbal communication during the session introduction. While performing the technical/tactical activities you can provide specific feedback or strategically stop the session and garner their thoughts as it relates to the non-verbal communication occurring. Your training session can also include specific technical drills with non-verbal communication parameters (non-verbal gestures and praise only). At the completion of the session you can either review the material or evaluate their knowledge. The more importance you put toward leadership training, the more your athletes will listen and learn. Remember this will be a change for them and people are often resilient to change. Create the culture and the rewards will be amazing. With regards to a curriculum, EducatedCoaches.com will be working on creating programs that can be instituted to educate all coaches within an organization. Most coaches training materials, clinics, etc. only focus on the technical and tactical components of the games. A goal of EducatedCoaches.com is to provide coaches material to help them become effective sport coaches that focus on the complete development of their athletes. Thank You for reply to the post and I look forward to future conversations! I believe many coaches stress only the technical side of the game largley because of not knowing any better. Many Coaches stress working on fundamentals, mechanics, and work ethic but very few actually work with their players and stress the mental/leadership aspect of their game. We expect our best players to “lead” the team but exactly how do they “lead” the team. Coach Matt, you mentioned you wondered what would have happened if you had leadership training. How do we have leadership training? Is this something we can sit our players down and go over a few points after a training session? Is this something we have as a “curriculum” with the organization we are associated with and teach in a classroom environment? And do players actually hear the tidbits we give them after a training session and before we excuse them to go home? Thanks.